The conference’s anti-Americanism, anti-Semitism, and anti-Zionism shocked Freidan—and diverted attention from the feminist agenda. Men, political spouses, or “female flunkies,” she noted, dominated most official delegations. Few of the delegates seemed interested in women’s issues. American feminists were mocked as spoiled bourgeois elites raising marginal concerns to avoid confronting more pressing issues of racism, imperialism, colonialism, and poverty. A thuggish atmosphere intimidated the American feminists, especially in the parallel NGO, or non-governmental organization, conference. At critical moments “microphones were turned off” and speakers shouted down. Friedan recalled in notes found in her papers, which formed the basis of her famous article “Scary Doings in Mexico City”: “the way they were making it impossible for women to speak—on the most innocent, straightforward of women’s concerns, seemed fascist—like to me, the menace of the goosestep.” Friedan saw the Israeli prime minister’s wife, Leah Rabin, booed and boycotted, and she watched, horrified, as the “Declaration on the Equality of Women” became one of the first international documents to label Zionism as a form of racism. When Third World and Communist delegates moved to link the Ten-Year Plan of Action for Women to the abolition of “imperialism, neocolonialism, racism, apartheid, and Zionism,” some feminist voices finally broke the silence. One European woman delegate told Friedan: “That is clear anti-Semitism, and we will have no part of it.” “If Zionism is to be included in the final declaration, we cannot understand why sexism was not included,” T.W.M. Tirika-tene-Sullivan, heading the New Zealand delegation, shouted. Lacking a two-thirds majority, the Arab and Communist delegates forced through a procedural change requiring only a majority vote to approve a declaration so that the anti-Zionist plank could pass. Following the conference, Friedan viewed these democracies’ flaws in perspective. America was at least acknowledging sexism as a problem. Upon her return to the United States, she also dedicated herself to the Zionist cause, advocating Jewish self-defense in confronting vicious, obsessive lies about Israel. Back home in New York, when the United Nations considered expelling Israel that fall of 1975, Friedan mobilized against the move in order, as she put it, to “save the U.N.” She noted that, having risen from the “ashes of the Holocaust,” the United Nations was now sacrificing its credibility in targeting one country. Many of the Asian and African delegates agreed with Friedan and vetoed the move, unwilling to risk their new status as member states by questioning Israel’s right to belong. Proclaiming that “all human rights are indivisible,” Friedan’s Ad Hoc Committee of Women for Human Rights objected to the racist label being “applied solely to the national self-determination of the Jewish people.” Politicians including Bella Abzug, Helen Gahagan Douglas, Margaret Heckler, Elizabeth Holzman, and Pat Schroeder; celebrities including Lauren Bacall, Beverly Sills, and Joanne Woodward; writers including Nora Ephron, Margaret Mead, Adrienne Rich, and Barbara Tuchman; Joan Ganz Cooney of Sesame Street; La Donna Harris, the American Indian activist; and the feminist Gloria Steinem, among others, joined Friedan’s committee. She realized that “to feminists who hate Israel, I was not a woman, I was a Jewish woman.” Launching a deeper Jewish journey, Pogrebin wondered: “Why be a Jew for them if I am not a Jew for myself?” Many Jews reported experiencing an identity reawakening following the public trauma of the “Zionism is racism” resolution. Like Pogrebin, and Theodor Herzl, many discovered that anti-Semitism can make the Jew, but it is more satisfying for the Jew to make the Jew. Globally, the battle only got nastier, and weirder. U.N. organizations and conferences worked diplomatically to “add Zionism to all the nasty ‘isms’ ” the world wanted “eliminated,” lamented the Israeli diplomat Tamar Eshel, who represented Israel at the U.N.’s International Women’s Conference in Copenhagen in July 1980. A huge portrait of Ayatollah Khomeini, Iran’s Islamist anti-feminist leader, decorated the conference headquarters, inside of which attacks on Israel, Jews, and America intensified. Most Third World delegates decided sexism was a Western problem, because only Western women complained about it. Women at Nairobi wanted to avoid the politicized ranting about Zionism and talk, Friedan noted, “as feminists about their common women’s problems.” In the middle of yet another dreary debate about Zionism and racism, a French woman began chanting: “The women of the world are watching and waiting.” Others joined in, until the PLO and the Iranian delegates finally relented. 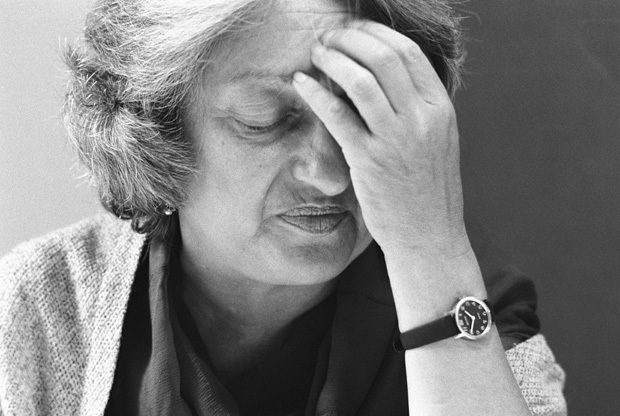 Representatives of 157 countries, many teary-eyed, many singing the conference’s unofficial theme song “We are the World, We are the Women,” unanimously adopted a final document with, Betty Friedan exulted, “every reference to Zionism gone.” The first major international movement to declare Zionism to be racism, the women’s movement now became the first to denounce that lie. Six years later, in 1991, the General Assemblyrepealed its infamous resolution. Yet, despite the heroic leadership of Friedan and her sisters, what Moynihan called “The Big Red Lie,” which insists that the national conflict between Israelis and Palestinians must be viewed through the distorting, inflammatory anti-Zionist lens of racism, still persists. Despite her victory in Nairobi, Friedan would be devastated to see that the libel she opposed with such courage and strength is now increasingly accepted by leading American feminists like Judith Butler and Alice Walker, who would rather identify with the warped gender politics of Hezbollah and Hamas than with the history and heroes of their own movement. Adapted from Moynihan’s Moment: America’s Fight against Zionism as Racism, by Gil Troy, with permission of Oxford University Press, all rights reserved.